The 17th and 18th century church belonging to the monastery of San Francisco in Lorca is inextricably associated with the Hermandad de los Labradores, otherwise known as the Paso Azul, and in fact stands alongside the building in which the brotherhood’s Museo Azul de la Semana Santa is housed. 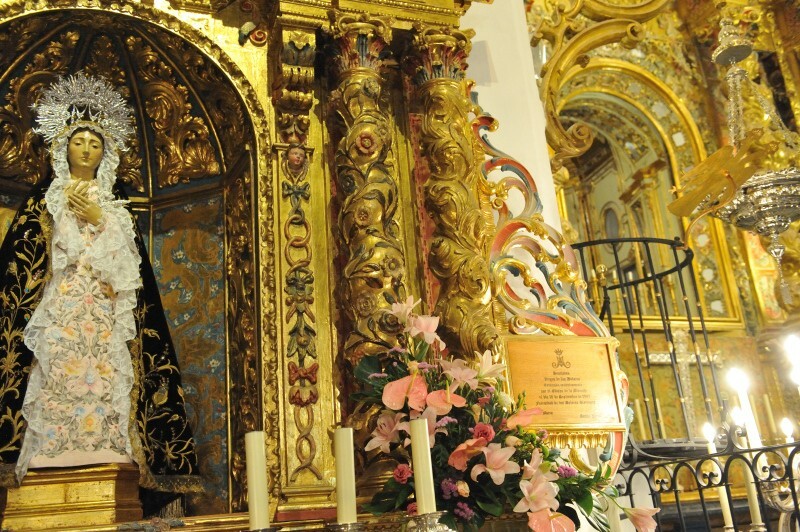 This museum contains many of the elaborate embroideries for which the Lorca Easter celebrations are famed, but the church itself is also worthy of note and has been declared a national monument. Its significance in Lorca is also underlined by it being the starting point for the Via Crucis route which leads to the hill of El Calvario (or Calvary). The first monastery founded in Lorca by the Franciscans was the Convento de las Huertas in 1467, but it was not until 1561 that construction of this church alongside the Convento de San Francisco began. The original was simple in structure, although it featured a main doorway by Lorenzo de Goenaga, who was also responsible for the Epístola doorway at the former Collegiate Church of San Patricio. In around 1638 a project to extend the building got under way, raising the ceiling higher and building the bell-tower, while at the same time a second level was added to the main doorway. This upper level features a niche containing a sculpture of the Virgin and Child, flanked by undetailed coats of arms, and atop all of this is the coat of arms of Lorca. 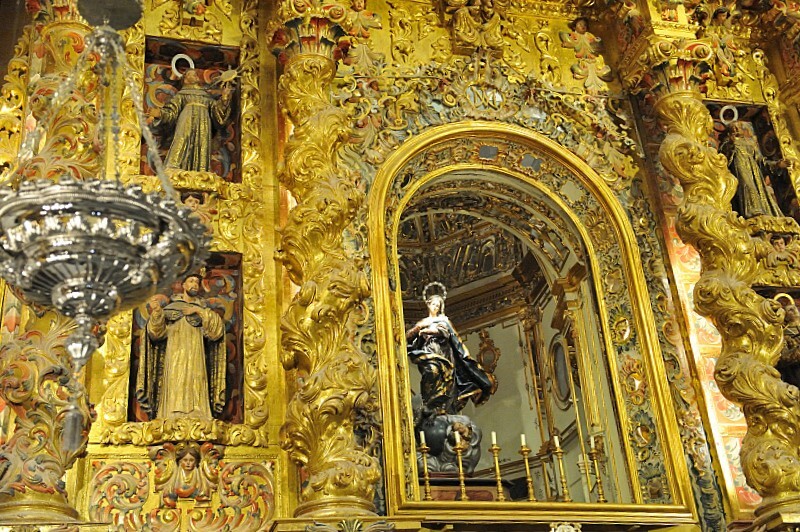 It was after this that the main baroque altar screen was commissioned from Ginés López in 1694, and various sculpted decorations were added during the following century until eventually, by the end of the 18th century, so many alterations had been made that little was left visible of the original structure. After the dissolution of the monastery in 1838 the church became dependent on the Parroquia de San Mateo, before becoming the religious seat of the Paso Azul. The inside and outside of the Iglesia de San Francisco present a marked contrast, with the exterior façade following simple and austere classical lines preferred by stonemason Juan Garzón while the interior features lavish rococo decoration. On the outside, the main doorway has already been remarked on above, and the bell-tower is a simple four-storey affair, retaining the original mechanisms of the timepiece. One of the bells was produced in Vitoria, while the other is from Lorca itself and dates from 1953. Inside the church, of particular importance inside the church are the full set of baroque altar screens, the only one remaining in the Region of Murcia. 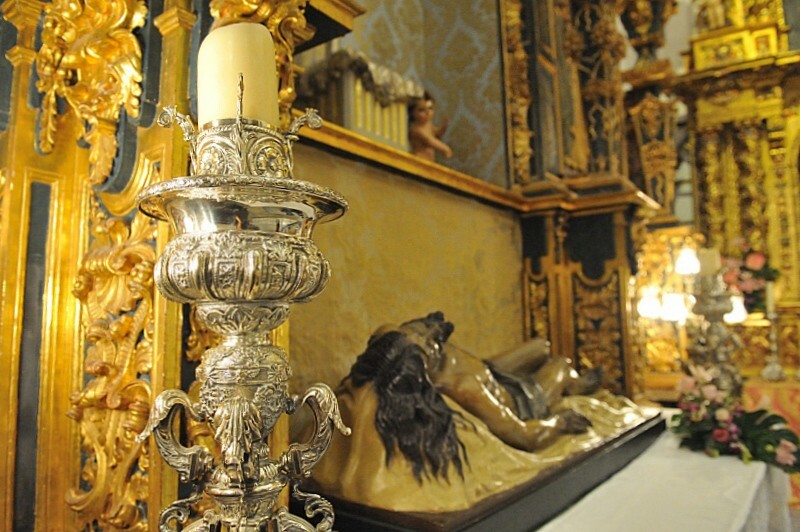 These include the main screen by Ginés López, dating from 1694, the two in the crossing by Jerónimo Caballero and Juan de Uzeta (1730 and 1735) – one devoted to San Antonio and the other to the True Cross and the blood of Christ - and the work from 1691 dedicated to the Virgen de los Dolores, by Manuel Caro. The main screen by Ginés López is replete with Franciscan imagery, and in the centre is the shrine to “La Inmaculada”, while the painting was created by Muñoz Frias in 1775. There is also one further screen by Manuel Caro in the right hand transept, dedicated to the “Virgen de la Pera”, or Virgen de la Paz. At the top of this stands a painting showing Saint John writing the Book of Apocalypse. 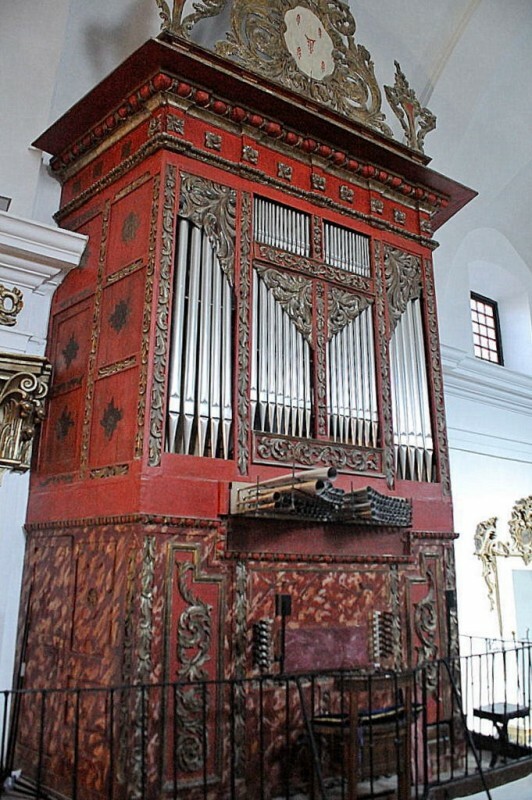 The church organ is also an interesting piece, and is the only one in Lorca which survived the Civil War (1936-39). 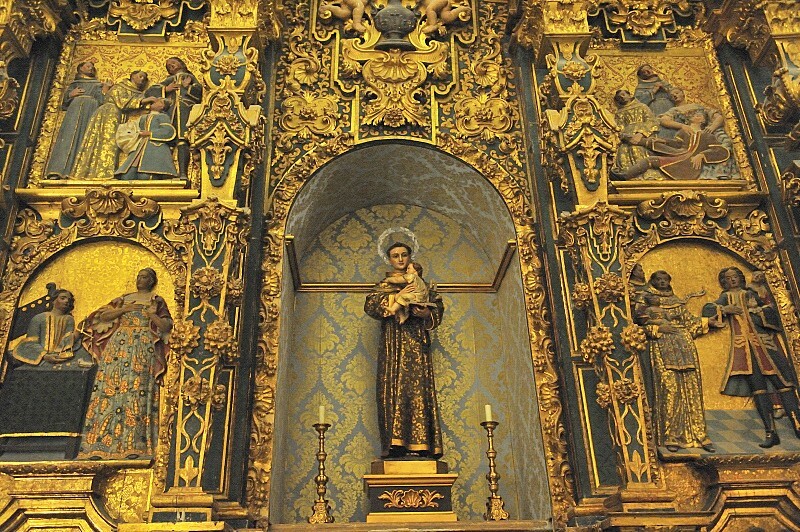 Apart from the altar screens referred to above, the Iglesia de San Francisco in Lorca contains important religious sculptures, among which the most significant for the members of the Paso Azul is the figure of the Virgen de los Dolores, the patron of the brotherhood, This was sculpted in 1941 by José Capuz Mamano, a native of Valencia who studied in Rome and later returned to the Region of Murcia, contributing numerous figures to the Cofradía Marraja brotherhood which plays an important role in the Easter Week processions of Cartagena. This figure plays an important role in the Semana Santa events, and is carried through the streets by the men of the Paso Azul. Another figure of note is the one by Jose Planes which shows Christ fallen (Cristo Yacente). Despite the fact that Planes produced numerous figures of this kind, later in his career he developed into more profane art with abstract tendencies, and the figure in the church of San Francisco is very similar to the one housed in the Iglesia de la Asunción in Cieza. 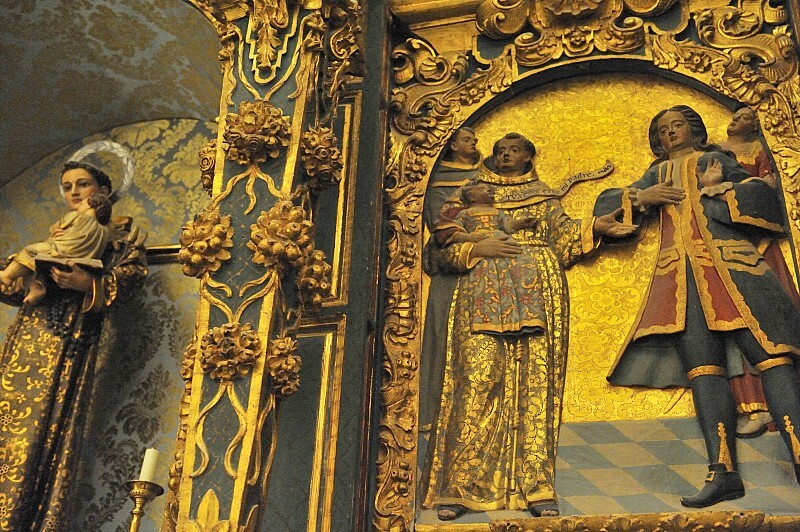 Two other statues which can be seen here are the early 17th-century Virgen de la Pera, attributed to Cristóbal de Salazar, and the “Inmaculada”, which is attributed to either the French sculptor Antonio Dupar or Fernández Caro. There are two paintings inside the church by Camacho Felices. Mass is held in the Iglesia de San Francisco every Sunday at 10.00, except during the months of July, August and September. 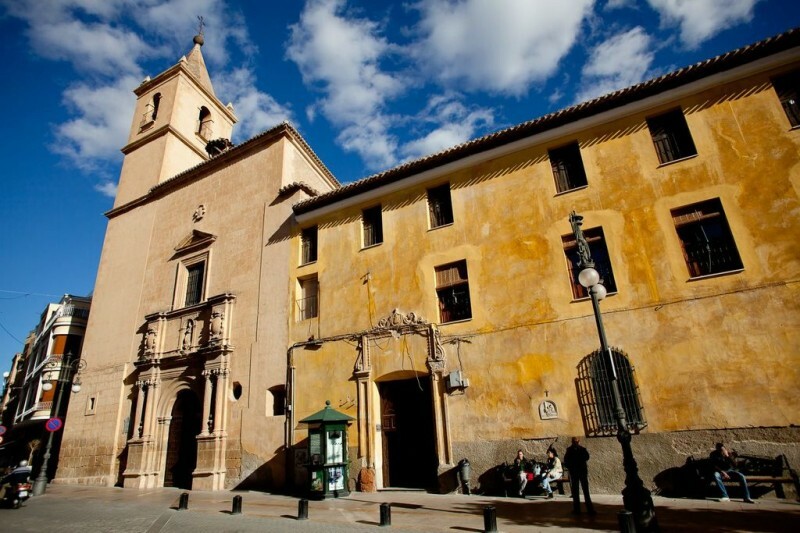 The church of San Francisco is situated at the crossroads of Calle Nogalte and Cuesta de San Francisco in the historic centre of Lorca, with the main entrance on Calle Nogalte. Outside of mass times, the chapel can be accessed from inside the museum dedicated to the Semana Santa embroideries owned by the Cofradía.